After a long while of panicking, Instagram is finally live on Windows store. What am i trying to say? If you operate a Windows 10 PC, you can now download and feel Instagram right on your Windows 10 PC without visiting or launching a browser. Though, i know long before now, we'd enjoy Instagram on PC but by visiting the official site or via 3rd party apps. Today, you will stop visiting the official site or using any 3rd party app as Instagram for Windows 10 PC is available for download. There is a bug been noticed in the app which makes the app crashes whenever you try to add a Story, especially if you’re using a PC without a backward-facing cam. Probably a new update coming soon or later will fix the bug. 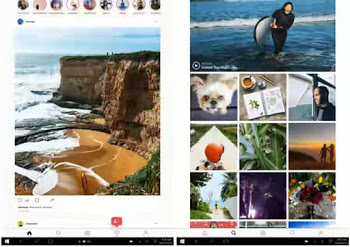 All the features found on Instagram for Android is equally on the Windows 10 version, starting from uploading pictures (you can upload pictures directly from your PC to Instagram), search for people, Profile, Explore, Feed, Stories, Chat and also get notifications right from your Windows 10 PC. WHERE CAN I DOWNLOAD INSTAGRAM FOR WINDOWS 10 PC? Download Instagram For Windows 10 Here.